Various additional programming interfaces are available, such as LXI TCP/IP Ethernet (+LXI), IEEE-488 GPIB (+GPIB), Edgeport USB Accessory (+USB), RS485 Accessory (+RS485). When in standby or diagnostic fault, the AC mains are mechanically disconnected by an embedded AC contactor, providing confidence that the unit is only processing power when desired. All SL Series MagnaDC power supplies come with a dedicated National Instruments LabVIEW™ driver, Interchangeable Virtual Instrument (IVI) driver, and support for a wide range of Standard Commands for Programmable Instrumentation (SCPI). These programming interfaces support full control, measurement, and monitoring of the MagnaLOAD. All of the MagnaLOAD's available communication interfaces are supported by these drivers and command sets, including: RS232, LXI TCP/IP Ethernet, IEEE-488 GPIB, USB or RS485. 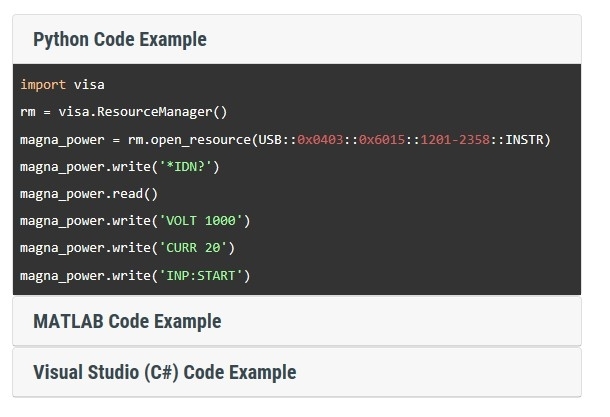 Showcased in the following basic code examples, SCPI commands provide the simplest form of communication by using plain ASCII text and parameters sent over a basic socket connection. Over 50 commands are provided, with detailed documentation in the SL Series User Manual. Finally, Magna-Power's RIS Panel software is provided allowing for a virtual control panel controlling the power supply via any of the available communication interfaces. 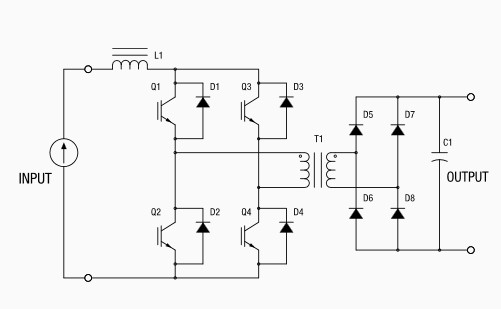 All MagnaDC programmable DC power supplies utilize high-frequency IGBT-based power processing in current-fed topology. This topology adds an additional stage over the conventional voltage-fed topology for enhanced control and system protection, ensuring that even under a fault condition, the power supply will self-protect. Due to the self-protecting characteristics of this topology, the possibility of fast rising current spikes and magnetic core saturation is elimated.